When it comes to screens, 3-D=lame: our own brains are more than capable of turning 2-D cues into full 3-D scenes without any weird glasses or other trickery. But 3-D scans are totally useful for all kinds of fun and frolics, as well as real, serious applications. And now you can turn your iPad into a 3-D scanner with the Structure Sensor. 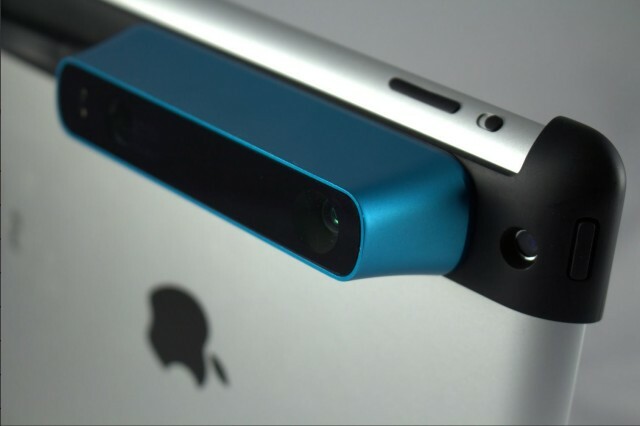 The Structure Sensor is a 3-D sensing camera which clips onto the back of your iPad and hooks into its Lightning port. The camera has its own battery, and grabs a VGA image at up to 60fps. That doesn’t sound like much, but it’s plenty enough to allow you to make a 3-D map of your room just by swinging your iPad around, or to play 3-D augmented reality games that actually interact with real objects in your environment. As for uses, these are really only limited by software, and the Structure project has a detailed SDK plus other hacker-friendly resources (a regular USB “hacker cable,” and a set of CAD plans so you can 3-D print your own accessories, for example) to help out in that regard. After tripping over the Kinect’s cord a few times, we realized that needing a high-end desktop CPU meant that this amazing technology was never going to make its way to everyday life. This is exactly the neat kind of thing I’d love to have built into the iPad. I recently moved into a new apartment, and it would have been great to have scanned the whole place and then used some kind of app to try out IKEA furniture before getting on my bike and braving the main arterial road to go buy it. Better still, I could 3-D scan objects from junk shops and flea markets and check them in my room right there on the spot before starting to haggle. The Structure Sensor is available for pre-order, and should ship next year in April. I guess I’ll just have to dig out my tape measure.